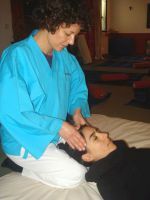 Professional Shiatsu Treatments are available at our B&B. An experience of wellness and entire vitality. The pressures applied to the whole body (dressed) induce a psychical-physical relaxation, generating a natural revival of the vitality and the resources of the person. Very helpful against stress, muscle tension and low energy. To maintain a good body condition and prevent every-day problems. Following tradition, the person remains dressed during treatment. Back to B&B Bio "Il Cielo"